“We teach kids facts as ready-made without giving them the capacity and cultivating the capability to ask what is the relationship between claim and evidence,” Wineburg said. He and others argue that asking students to memorize precise dates does very little to give them a broader sense of the arc of history. Will Colglazier, a U.S. history teacher in the San Mateo Union High School District, is taking this call to action to heart at Aragon High School. 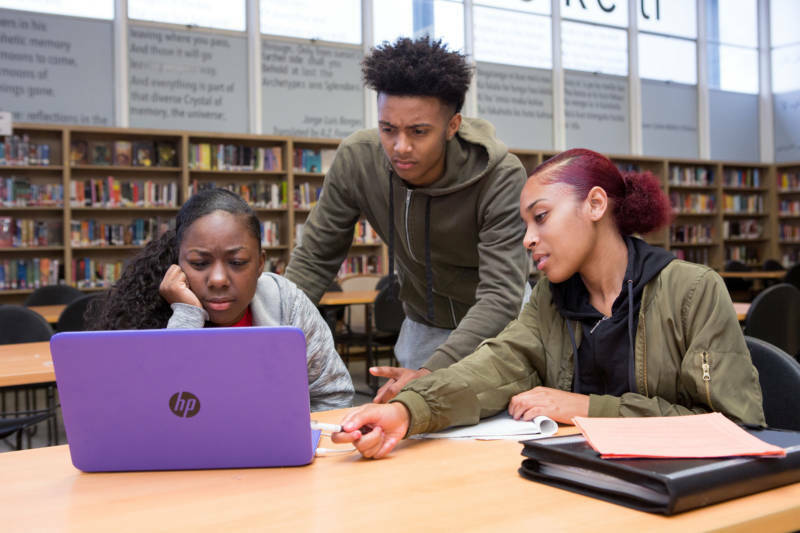 He, like so many teachers, feels pressure to cover all his content and keep to the pacing guides, but he also thinks students need fundamental digital literacy skills in order to continue learning history into the future. Colglazier balances the curriculum coverage pressure with cross-cutting skills by thinking carefully about his course goals. He establishes those at the beginning of the year so that if he ends up cutting a unit to make time for something else, he can be sure he’s still hitting those goals. Especially in his Advanced Placement classes he feels pressure to get through all the material, to make sure his students get high scores, and thus succeed. But at some point he decided enough was enough. “I kept getting frustrated teaching the course and having my unit tests aligned with what the AP test is like,” Colglazier said. That led to boring assessments and a boring class. Instead, he decided to mix in more historical inquiry into his classes, with plenty of practice on the AP-style test questions as well. He started asking more controversial, open-ended questions and asked students to find information to support their claims about those topics. He wanted students asking questions and engaging in the activities of real historians, so he pushed students to engage their critical thinking skills, put issues into context, and gave them opportunities to close read for perspectives and silences. He thought those historical skills would transfer to the digital space -- but he was wrong. His students didn’t do well on the Stanford test to determine ads versus news stories. But they were doing a lot of online research in class already, so Colglazier decided to spend some time explicitly teaching students how to fact-check websites, to read laterally, and go beyond slick-looking web design. Now, Colglazier regularly replaces multiple-choice or short-answer questions with activities that require students to mimic the experience of online research. He’ll ask a broad question and send them to an article that may not be from a reliable site. Students have to figure out if they can trust the information and, if not, find more reliable sources to back up their claims. Colglazier is also trying to be clearer with students about how these skills apply to both history and life. Often students get nihilistic at first, thinking that every time they visit a website they’ll have to go down a research rabbit hole. That may be the price of living in a world with so much information at their fingertips; they have to ask questions about their sources. The textbook itself is ripe for interrogation in Colglazier’s class. Textbook can be a useful course skeleton, he says, but he wants students to question its silences and framing as well. “When students read the textbook, they mine it for facts without thinking meta about it,” he said. “And we want to teach them to do that with all their information. You’re protecting them from learning to some degree” if you don’t. Sam Wineburg at Stanford doesn’t blame teachers for not immediately knowing how to teach these crucial digital media skills, but he hopes studies like his will prompt changes. In the short term he wants everyone -- adults and kids alike -- to learn to use the internet like fact-checkers do. On top of that, he’d like to see social studies teaching shift away from covering every unit in a huge textbook, and toward critical inquiry about history. Beyond all that, he thinks we need a dramatic change in how we consume information. Without this type of dramatic change to teaching, Wineburg worries democracy itself is at stake. If society can’t determine what a fact is, he argues, then we have no basis for a justice system and the propagandists win. “That’s a slippery slope to a non-democratic form of government,” Wineburg said. Colglazier is doing his best to prevent that from happening by making sure the next generation of voters know better. “What I’ve tried to instill with them is the concept of evidence-based and holding both sides accountable,” he said.